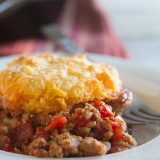 This Skillet Turkey Pot Pie has cheesy buttermilk biscuits on top a flavorful turkey chili making a quick and easy dinner. As much as I love cooking, sometimes it’s all about just getting dinner on the table. Well, most of the time lately it’s just about getting dinner on the table. When you have a 5 year old, 3 year old and almost 2 year old, dinner time is definitely the most hectic time of day. That, and the 10 minutes before the bus comes in the morning. 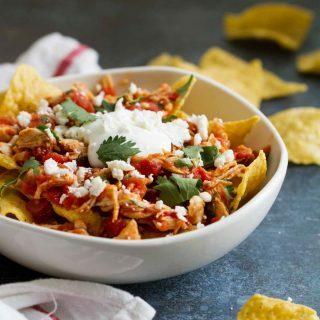 So needless to say, I’m always on the lookout for recipes that are not only easy and family friendly, but ones that won’t make a total mess of my kitchen. You see, when we were looking for somewhere to live, I will admit that I was blinded by the gas stove and open floor plan of our house. I knew there wasn’t a lot of counter space, but I thought it was enough. Well, I was wrong. It is impossible to multi-task with recipes, and if it’s not simple, you’ll find me frustrated in the kitchen, having no where to work. Enter the one pot recipe. Yes, ladies and gentlemen, one pot recipes save my sanity. 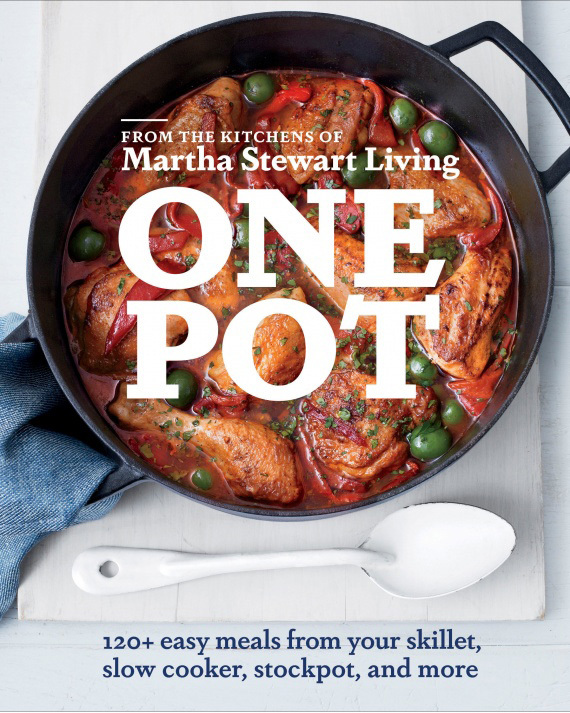 So when I saw the newest cookbook from the kitchens of Martha Stewart Living – One Pot – I knew I had to have it in my kitchen. What I didn’t realize, though, was that while I was just expecting one-pot stovetop recipes, this cookbook is so much more. There are chapters dedicated to the Dutch oven, skillet and saute pan, slow cooker, roasting pan and baking dish, pressure cooker, and stockpot and saucepan. Plus a chapter on desserts, which was a surprise as well. I love the array of recipes and I know that I won’t get bored cooking from this book. 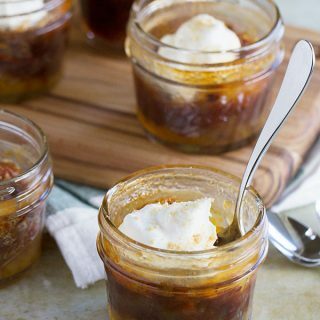 You get a photo of every recipe, and they are all beautiful, in true Martha Stewart style. 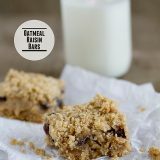 These recipes have super simple ingredient lists. And most only have a handful of ingredients. I don’t think you’d have to hit up a specialty store for any of the ingredients. I went back and forth trying to decide what recipe to start with, but ended up making this Skillet Turkey Pot Pie. 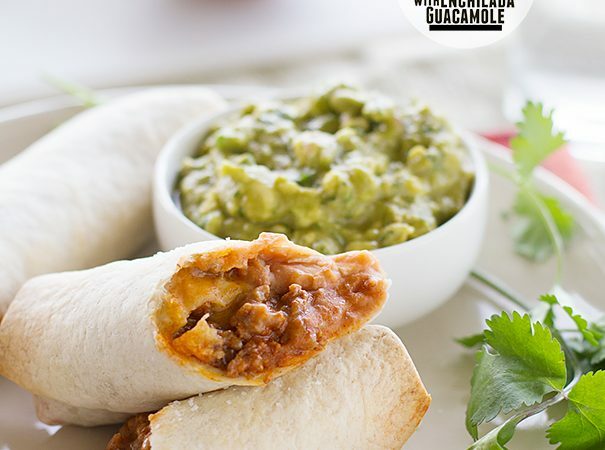 It was a cold day, and this easy recipe was the perfect comfort food for dinner that night. I will be the first to admit that I’m not usually the biggest ground turkey fan. I find that compared to ground beef, it has little flavor. But this turkey pot pie recipe? I was totally sold. 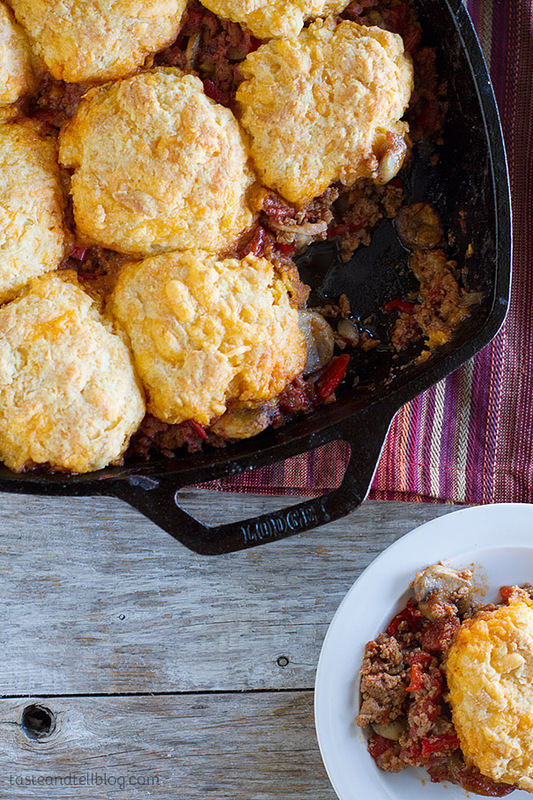 You start out with an easy turkey chili, filled with red bell peppers, onions and mushrooms. Then you top the turkey with cheesy buttermilk biscuits. The whole thing goes into the oven until the biscuits are golden brown, and dinner is served!! The biscuits were much drier than I was expecting – I had to pat them into biscuits with my hands, so I didn’t have high hopes for them coming out very well. But they were perfect! They held up well against the turkey, and the whole dish was just packed with flavor. 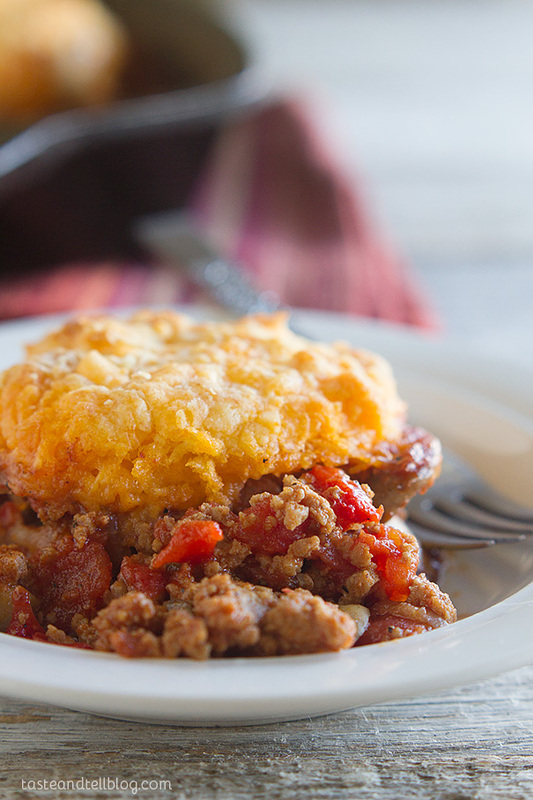 This Skillet Turkey Pot Pie is definitely a recipe I would go back to again and again! In a large, heavy, ovenproof skillet over medium-high heat, heat the oil. Add the bell pepper, onion and mushrooms and cook until softened, about 8-10 minutes. Season with salt and pepper. Add the tomato paste and cook for a minute or two until fragrant. Add the turkey and chili powder and cook, breaking up the turkey, until the turkey is browned and cooked, about 3-5 minutes. Add the tomatoes (undrained) and cook until some of the liquid has evaporated, about 3 minutes. Season with salt and pepper, then remove from the heat. Meanwhile, in a bowl, whisk together the flour, baking powder, baking soda and salt. Cut the butter into the flour mixture using a pastry cutter or a fork. Stir in the buttermilk and the cheese just until moistened. Divide the mixture into 9 equal pieces and form into 9 biscuits. Place over the turkey mixture. 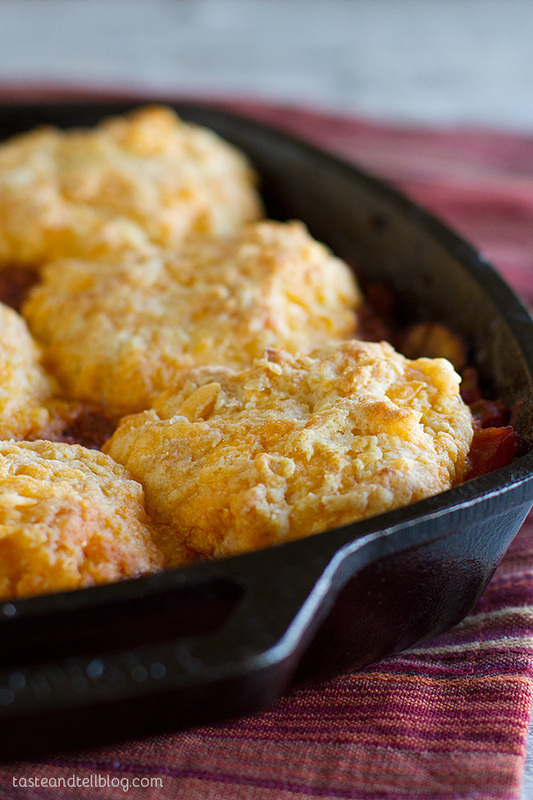 Bake in the preheated oven until the biscuits are golden brown, about 20 minutes. *I only used 1/2 tablespoon chili powder since I was feeding my family, and it was still very mild. 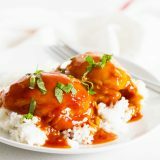 What a great comfort dish! Perfect as we head into the cooler months. And I love the “one pot” concept. With our baby due in the next couple weeks, I’m all about making sure we have lots of easy meals up our sleeves! One pot meals are so handy, I love not having boatloads of dishes to do after supper! This meal looks delicious. Sounds like a great cookbook! I love that there is a chapter dedicated to Dutch ovens. I always want to use mine more. 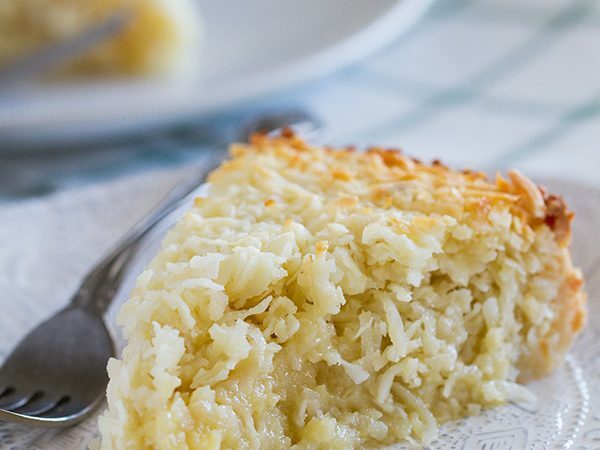 I love cooking in my skillet so this recipe is just so perfect for me. I love that you used turkey as well – cannot remember the last time that I cooked with it. 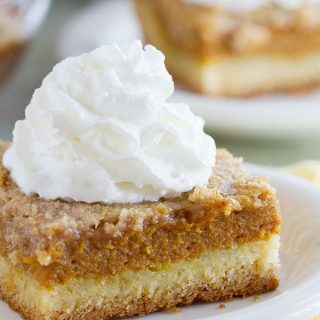 Definitely a recipe I must make! This one sounds great! Please consider that Curry Chicken Pot Pie recipe next! 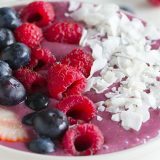 Thanks for your blog–i enjoy the eye candy, even if i don’t get much time in the kitchen!! Blessings! This was one of the first recipes I’ve made from this book too! I loved it! I want to make it again and again! Right now I’m finishing up the Three Cheese Lasagna (also a hit!) and trying to figure out which recipe to try next. 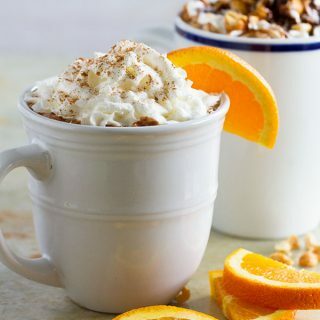 Gourmet Hot Chocolate – 2 Ways!